Heat tracing a pipe, from start to finish can be time consuming. Selecting the various components, starting with the heating cable itself, extends through termination kits, controllers, mounting hardware and other electrical hardware needed to put the heating system in operation. 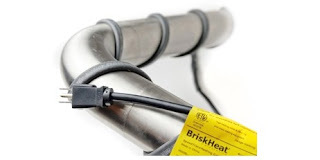 BriskHeat has a product that, for many applications, offers a very simple and quick solution. Pre-assembled self regulating heat cable is available in two voltage ranges, two watt densities, and prefabricated lengths up to 150 feet. Each cable is terminated at each end, saving the installer time. The cable is flexible enough for a spiral installation or to wrap around valves in the piping system. The self regulating aspect of the cable negates the need for a controller and power switching devices. Assemblies targeted for 120 volt applications are provided with a factory installed plug. The 208-277 volt cables will arrive with bare wire leads for installation of a customer provided connector. The cable can be easily installed using fiberglass or aluminum tape. Suitable insulation applied over the finished work will improve the performance of the heating system. Share your heat trace and freeze protection challenges with industrial heating specialists, leveraging your own knowledge and experience with their product application expertise.